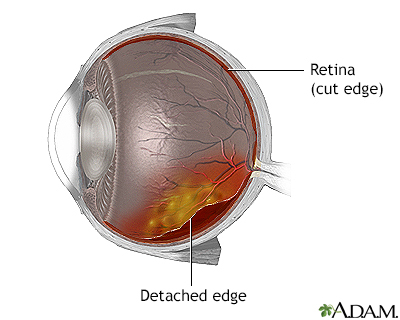 Retinal detachment repair is eye surgery to place a retina back into its normal position. The retina is the light-sensitive tissue in the back of the eye. Detachment means that it has pulled away from the layers of tissue around it. This article describes the repair of rhegmatogenous retinal detachments. These occur due to a hole or tear in the retina. Most retinal detachment repair operations are urgent. 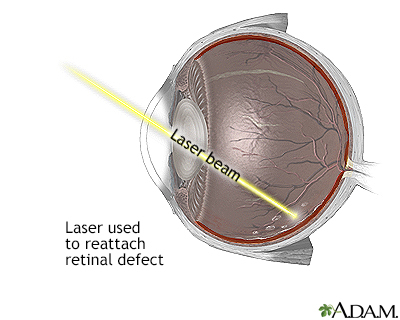 If holes or tears in the retina are found before the retina detaches, the eye doctor can close the holes using a laser. This procedure is most often done in the health care provider's office. If the retina has just started to detach, a procedure called pneumatic retinopexy may be done to repair it. Pneumatic retinopexy (gas bubble placement) is most often an office procedure. The eye doctor injects a bubble of gas into the eye. You are then positioned so the gas bubble floats up against the hole in the retina and pushes it back into place. The doctor will use a laser to permanently seal the hole. 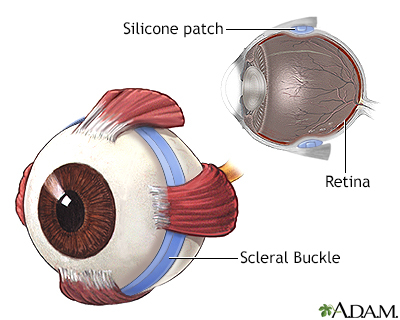 The scleral buckle method indents the wall of the eye inward so that it meets the hole in the retina. Scleral buckling can be done using numbing medicine while you are awake (local anesthesia) or when you are asleep and pain free (general anesthesia). The vitrectomy procedure uses very small devices inside the eye to release tension on the retina. This allows the retina to move back into its proper position. Most vitrectomies are done with numbing medicine while you are awake. In complex cases, both procedures may be done at the same time. Retinal detachments DO NOT get better without treatment. Repair is needed to prevent permanent vision loss. How quickly the surgery needs to be done depends on the location and extent of the detachment. If possible, the surgery should be done the same day if the detachment has not affected the central vision area (the macula). This can help prevent further detachment of the retina. It also will increase the chance of preserving good vision. If the macula detaches, it is too late to restore normal vision. Surgery can still be done to prevent total blindness. In these cases, eye doctors can wait a week to 10 days to schedule surgery. You may not recover full vision. In most cases, the procedures DO NOT require an overnight hospital stay. You may need to limit your physical activity for some time. If the retina is repaired using the gas bubble procedure, you need to keep your head face down or turned to one side for several days or weeks. It is important to maintain this position so the gas bubble pushes the retina into place. People with a gas bubble in the eye may not fly or go to high altitudes until the gas bubble dissolves. This most often happens within a few weeks. Most of the time, the retina can be reattached with one operation. However, some people will need several surgeries. More than 9 out of 10 detachments can be repaired. Failure to repair the retina always results in loss of vision to some degree. When a detachment occurs, the photoreceptors (rods and cones) start to degenerate. The sooner the detachment is repaired, the sooner the rods and cones will begin to recover. However, once the retina has detached, the photoreceptors may never recover completely. If the central area of vision (macula) was not involved, vision will usually be very good. If the macula was involved for less than 1 week, vision will usually be improved, but not to 20/20 (normal). If the macula was detached for a long time, some vision will return, but it will be very impaired. Often, it will be less than 20/200, the limit for legal blindness. Todorich B, Faia LJ, Williams GA. Scleral buckling surgery. In: Yanoff M, Duker JS, eds. Ophthalmology. 5th ed. Philadelphia, PA: Elsevier; 2019:chap 6.11. Wickham L, Aylward GW. Optimal procedures for retinal detachment repair. In: Schachat AP, Sadda SVR, Hinton DR, Wilkinson CP, Wiedemann P. Ryan's Retina. 6th ed. Philadelphia, PA: Elsevier; 2018:chap 109. 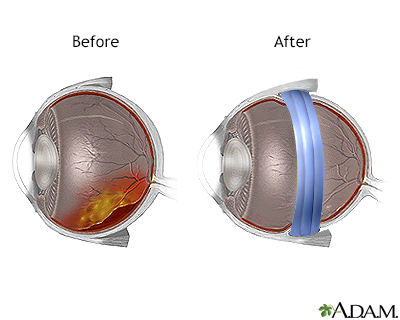 As a result of injury, tumors, or disease, the retina can become completely or partially detached causing diminished vision. 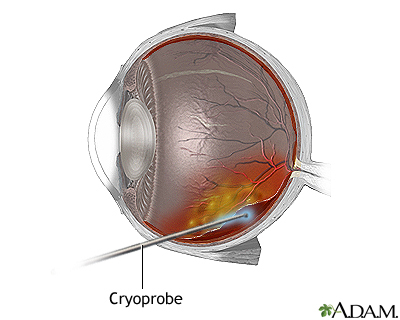 The retina can be repaired by laser, cryoprobe, or surgery.